2. Slice the raw chicken breast in half and place two sun-dried tomatoes, two sliced olives and three to four torn basil leaves in between each breast. 3. 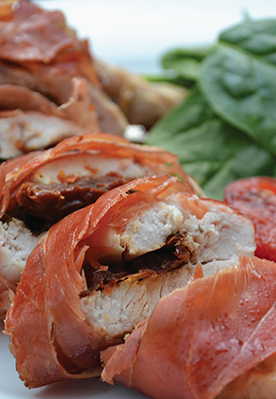 Wrap each breast with three slices of prosciutto to seal the filling in place. 4. Place on a baking sheet and bake for 25 minutes.